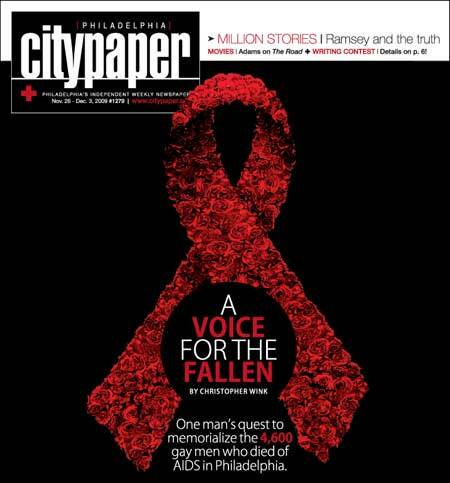 Today — yes on Thanksgiving — I’m happy to say I have the cover story on this week’s Philadelphia City Paper, the popular alternative newsweekly, profiling Chris Bartlett and his push to chronicle the lives of 4,600 gay men he says died in Philadelphia after being diagnosed with HIV/AIDS. I previously wrote a shorter feature on Bartlett and his Gay History Wiki for Technically Philly, and he was recently interviewed by the Philadelphia Gay News. Below, as always, check the extras from a half dozen interviews I did and other goodies from the research of this piece. Tonight I’ll be in attendance at something of a unique event: an adult film world premiere. I briefed the event for the Philadelphia CityPaper in today’s edition [third item down].